For parents of children with disabilities: How have earlier interactions with individuals with Down syndrome – or other disabilities influence(d) how you felt and feel about your child’s diagnosis? For people with disabilities: How have earlier interactions with individuals with disabilities influenced how you feel about your diagnosis? Where I grew up I never saw a person with down syndrome or any other disability, for that matter. I was educated in a private school, which made my chances of having a classmate with a disability even slimmer. Once in a while I heard about a family who lost their baby "at birth", which to me at the time suggested death, but I have since learned has two meanings. The first person I met with down syndrome was on June 19, 1993 and her name was Alex. I do not know if that was a good thing or a bad thing, I only know when Alex was born we saw a baby, who just happened to have an extra chromosome. Sure the first weeks were hard, but in our hearts we believed Alex would grow, thrive and contribute just like her siblings and just like her peers. 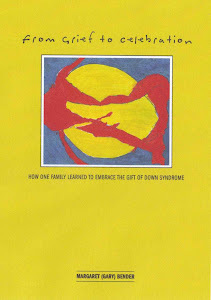 The following excerpt from our book of lessons of down syndrome, shares how I feel about how down syndrome has impacted on our lives, the lives of our families and our community. Down syndrome has taught us what celebrate really means. As with many of the other verbs celebrate has two meanings to us. We celebrate the pure joy of Alex; she has enriched our lives in ways I never knew existed. We have learned compassion, caring, and acceptance. We have become better people. 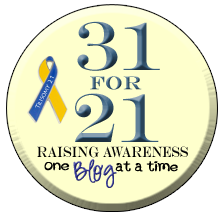 As an example, I relate the “stop and smell the roses” syndrome all parents of children with down syndrome share. It is the celebration of life I believe we used to miss in our everyday lives. Thank you Alex.